Erma and I really loved it! Mini me and I ..
We really had fun enjoying the beach, great sunny day, and friendly people. 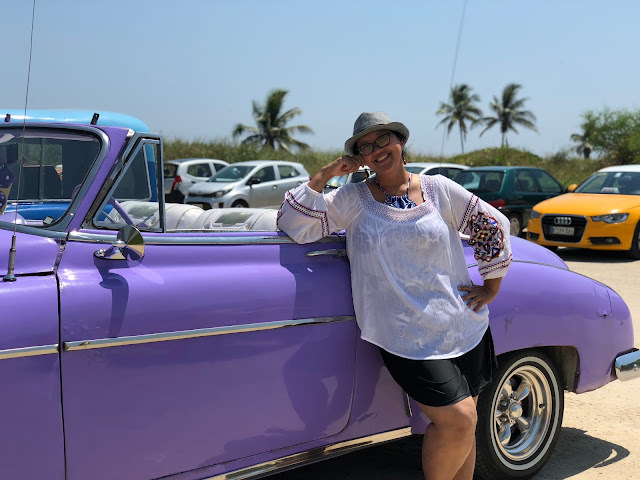 And the last surprise that I love is the purple vintage car I saw on the beach! Do you think you will go to the beach while visiting Havana, Cuba? Join u on (almost) Wonderful Wednesday and link up for more fun. That water is the cleanest I've ever seen! The purple car is wonderful! I love the purple car!!! Ow...this is the moment when Mama Bo holiday at Cuba? So memorable with those beautiful car, isn't it? Beach at Cuba, why not! Oh so beautiful I enjoyed your lovely photos and the smiles heheh! Cuba is very far away, maybe I haven't thought of going there. Hehehe. Btw itu mobil lucuuuuk amaat ! Salfok sama mobil ungu tuh. Cantik lucu plus unyu unyu heheee. Btw happy traveling ya mba. Nikmati momennya dan selalu bahagia. Amin. Ciamik sekali ya Havanaa, seneng baca blog mb Indah, selalu nambah wawasan. That purple car! That's too much! Girl, that car is so you! You look beautiful posing next to it ♥ I would love to visit a Cuban beach one day. The water really looks inviting!